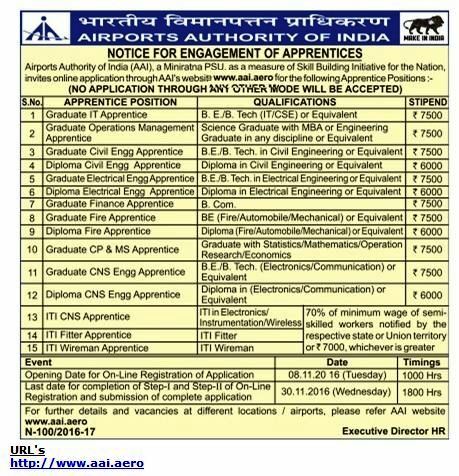 Airport Authority of India (AAI Recruitment) notification nov 2016 released for the post of Apprentice for various given Trades to fill up total huge vacancies. All eligible candidates should have to apply from 08.11.2016 – 30.11.2016. Check the eligibility criteria, selection procedure, job description & other details of aai recruitment 2016 given below. Age Requirement : Candidates age should be minimum 18 years. Age relaxation will be provide for various categories as per govt rules. Qualification : possess ITI in relevant field to their applying post. Eligible candidates should have to apply online through the official website www.aai.aero from 08.11.2016 – 30.11.2016. Only online mode of application & payment is allowed. no offline mode will be accepted. Please ensure your eligibility before apply.